Lawrence B. Brown was born enslaved in 1856, during the last decade of slavery. He was born in an area known as Wacahoota, located near Gainesville, (Alachua County) Florida...His father, Peter Brown, was a plantation minister and his mother Catherine was a Native American. Lawrence was the sixth of seven children. Recent research suggests that there may have been as many as eleven children. Following the end of slavery in 1865, Peter Brown applied for an received a homestead land grant of 39.5 acres near Archer, Florida, also located near Gainesville. At some point during the mid 1870's the Brown family relocated (Westward) to Spring Garden, Florida (Volusia County). In 1881, Lawrence married Elizabeth (Betty) Washington and acquired a considerable amount of property where he constructed homes that he sold or rented. Within the subdivision he named a street Lawrence after himself. Following the death of his father Peter in 1885, Lawrence moved to Bartow, Florida. Due to the recent discovery of phosphate and the construction of the railroad Polk County experienced an economic boom. Adhering to his father's final request, Lawrence brought his mother Catherine to live with him in Bartow.. His wife Elizabeth apparently died sometime in the late 1880's. . Continuing the pattern of his earlier successes, Lawrence acquired property in Bartow and built a large number, perhaps as many as 50 - 60 houses which he sold or rented. In 1897 Lawrence married a second time to a woman named Laura Lee. She was the daughter of one of his tenants. This marriage dissolved within 2 months. Lawrence appeared to live contentedly with his mother for nearly ten years. Through determination, and thrift Brown became a prosperous businessman and a leading citizen in the Bartow community. He became a faithful member of the newly organized Mt. Gilboa Missionary Baptist Church where he served for many years as the church clerk. 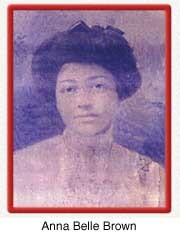 In 1909 Lawrence Brown married a beautiful widow named Anna Belle (Granger) Burnette. Together they reared seven children and enjoyed a happy union until her death in 1938. She contributed significantly to the marriage as a result of her intelligence, strong will, and dedication to her husband and children. In contradiction to his 6' 4" height, Mr. Brown was a soft-spoken man who chose his ward carefully. 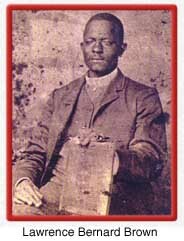 Mr. LB, as he was also called, was credited with several occupations including Bible salesman, cabinetmaker, furniture repairman, mirror silvering, and umbrella repairman. And, of course, he also built beautiful homes! He was a devout Christian who was generous with his wealth. Brown was a leader by example. At the time of his death in 1941, he left a considerable amount of cash and real-estate to his children. His net worth is estimated to have been somewhere around a half million dollars, in todays valuation. . The Victorian style, two-story mansion located at 470 L. B. Brown Avenue (formerly Second Avenue) in Bartow stands as a living testimony to one person's triumph over adversity. The story of L.B. Brown serves as an inspiration to everyone. Although born under the debilitating influences of slavery, he refused to be limited by those circumstances. An appropriate inscription on his headstone reads; "From slavery to community builder." In 1998, the Florida Department of State bestowed the honor of "Great Floridian 2000" upon L.B. Brown, and in 2016, the Smithsonian "National Museum of African American History and Culture" selected the story of L.B. Brown and the Historic L.B. Brown House Museum as one of its inaugural exhibits (located on floor L4).. .